Pictured above is a Women’s’ Side Saddle with leather seat belonged to Lena Lightly Endner. She rode this saddle in the Pioneer Parade for many years. This saddle was donated by Bill Endner, her son. 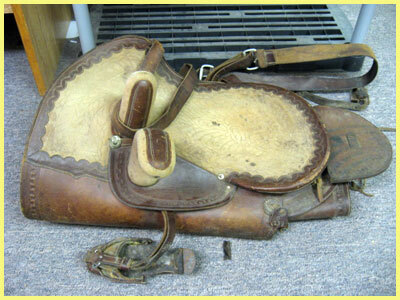 Our article today is about saddles. The primary mode of travel in the 1800’s was by horse back and the saddles were a very important part of this type of transportation. 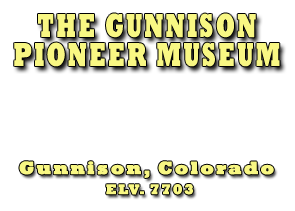 In the next few weeks I will be writing about the history of Gunnison and how the Gunnison Pioneer Museum was developed and where all of the displays came from and their history. Our next saddle is a lady’s saddle that was used by the Carpenter family in the Iola and Sapinero area. This saddle is on loan by Hugh (Sony) Carpenter. Margaret Flick was the rider of the next saddle. This side saddle has a carpeted seat and riding skirt made by Denver Mfg. Co #582. There are two more Women side saddles on display. Our last saddle that we will discuss today was the saddle that Ruby (Carpenter) LeValley of the LeValley Ranches’ of Sapinero and east of Gunnison, this is not a side saddle. Today we will discuss the cattle industry, which was one of the first and most prominent industries in Gunnison. We have to go back a few years to find the group of men who started the Gunnison County Stock growers Association. It was in 1884, that a group of ranchers held a meeting to decide if and what kind of a rancher’s organization they wanted. After holding several meetings, the committee chaired by D. A. McConnell, J.A. Steele, secretary, Thomas C. Brown, J. B. Partch, J. H. Andrews, T. W. Gray, and H. M. Webster gave their recommendations to the group of ranchers and the Gunnison County Stock Growers’ Association came into existences. The following people were elected as the first officers: President, Alonzo Hartman; Vice-president, J. H. Andrews; Secretary, C. L. Stone; Treasurer, A. E. Hyzer. Some of the more prominent ranchers at that time were A. W. Mergleman, P. H. Vader, F. E. Lightley, K. Montgomery, Sapinero, W. P. Sammons, Powderhorn and H. C. Bartlett. All of which held office in the Stock Growers’ Association. Within 10 years the organization grew to over 200 members, included more than 300 ranches and over 20,000 cattle. More on Stock Growers’ Association in future articles. In 1905 the Gunnison County Pioneer and Historical Society came into existence. The Historical Society at first was for men only, they had to live in Gunnison for 50 years or more. In 1906 the Gunnison County Pioneer and Historical Society decided to become a permanent sponsor of a local museum. The group after a few years decided to allow women to join the Gunnison County Pioneer and Historical Society. The museum did not get started until 1964 until they received the land which the museum sets on from Adams and Wilson Ranch. Remember the Pioneer and Historical Society are always looking for things to display (If you have anything that would show some of Gunnison History) contact the museum. We are always accepting new membership. Please contact us if you want join the Museum.